A shepherd and his flock return home at evening in a scene also known as An English Pastoral. Palmer assembles different landscape elements, imagined and observed. The solitary figure, the sheep, and the moon are familiar from his earlier work in the village of Shoreham. The distance recalls the hilly scenery of Devon or Wales, whilst the cypress trees were perhaps noted on Palmer’s Italian trip. The joy of etching, Palmer wrote, lies in ‘the glimmering through of the white paper … so that almost everything either sparkles or suggests sparkle’. 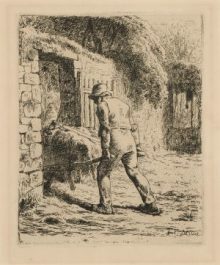 Searching for these qualities, Palmer continued to rework this etching throughout his life. We show a rotating selection of works on paper in our two dedicated exhibition spaces.If you wish to view a work not currently on display, you can make an appointment to see it in the Prints and Drawings Study Room, which is equipped with viewing lecterns and a study/seminar table.